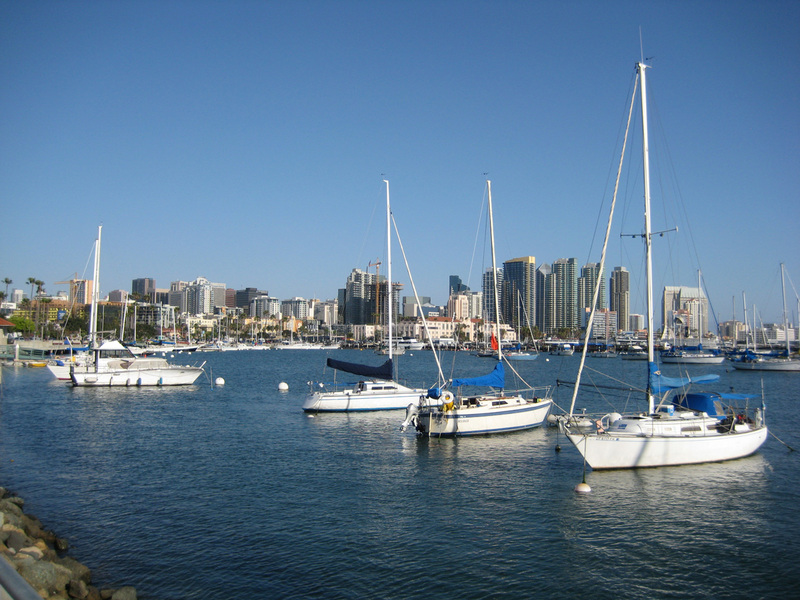 Running in San Diego…what a trip! San Diego is a beautiful place to run. Along the coast, the cloud cover is present until around noon, but go inland a few miles and the sun breaks through early. The temperature is usually fairly moderate, even in the summer, and it never gets too cold in the winter. Staying in San Diego for my daughter’s graduation, I had the opportunity about two weeks ago to do one of my favorite loops, a ten mile run which runs from her apartment, around Balboa Park, down hill to Harbor Drive, along the paved walk along Harbor Drive, then back up to Balboa Park, along El Prado, and finishing past the San Diego Zoo and back to her apartment. 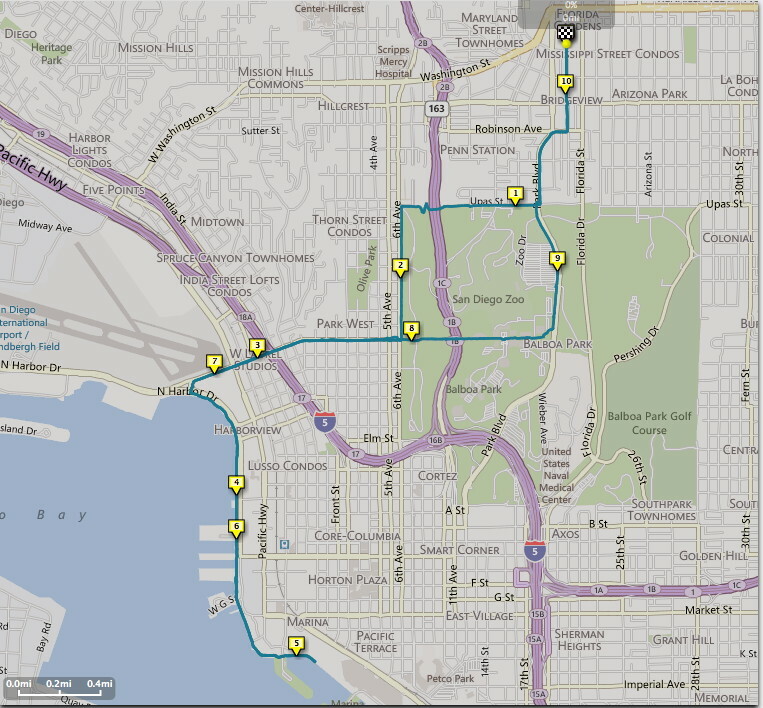 This loop starts about a mile from Balboa Park. Running along the edge of the park, there is a steep downward path leading to a bridge over highway 163, then a steep climb back up to the park level. Along 6th Avenue, there is a lot of room on grassy areas for early morning yoga classes and other fitness trainees using the free access to the park to their advantage. The usual park dwellers, also known as homeless, although they consider this their home, also hang out here. Their daily activities are set by the timing of the park sprinkler system. 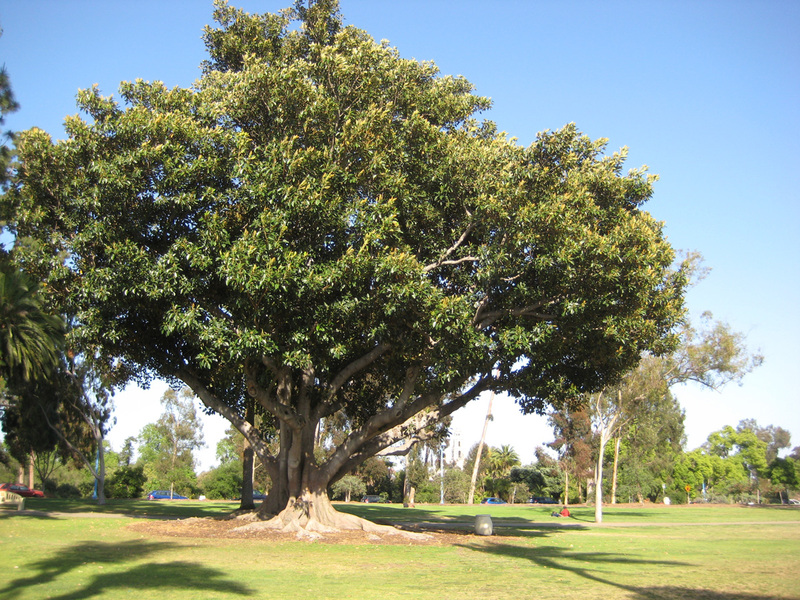 Tree in Balboa Park, near the favorite spot for Ultimate Frisbee. The route then turns westward down Laurel Street towards Harbor Drive. I do mean downwards, too, as the drop from the park to the harbor is about 300 feet over a mile. 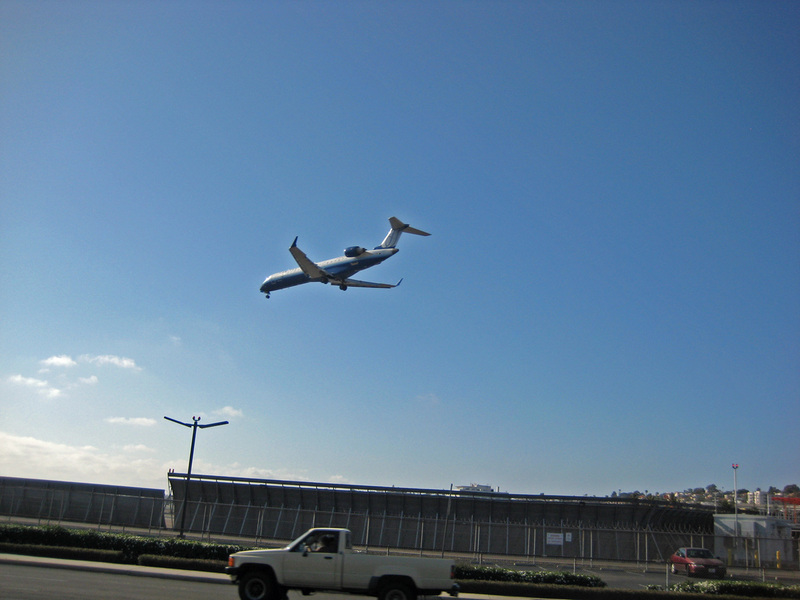 Laurel Street passes the San Diego International Airport, also known as Lindbergh Field. 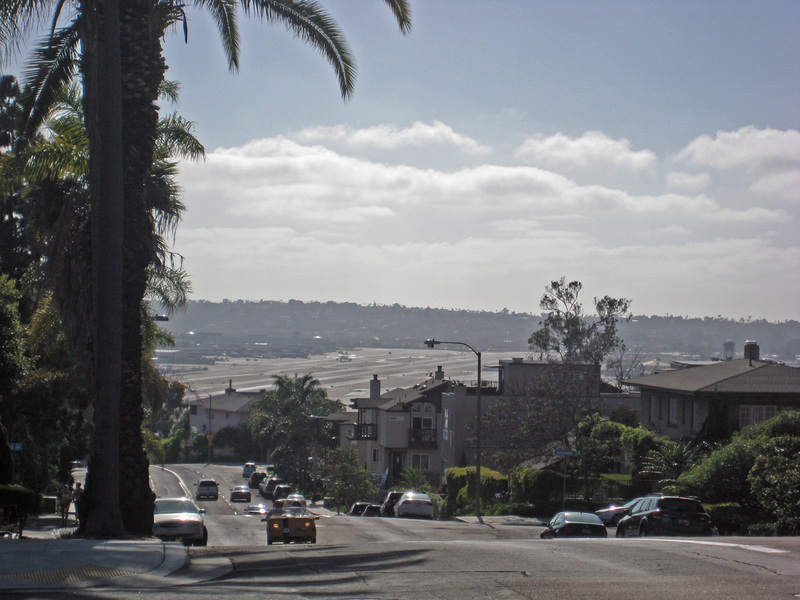 Lindbergh Field’s runways seen from Laurel Street. The planes landing at Lindbergh Field fly right over the buildings of downtown San Diego. Plane coming in to Lindbergh Field for a landing. Once one reaches harbor drive, it is a nice flat run to the south along the pedestrian way. There is a marina specifically for sailboats at the base of Laurel Street. Maneuvering past the navy ships in the harbor may be a bit challenging, but then one can sail to the Coronado Islands, or Catalina, or perhaps down to Baja California. 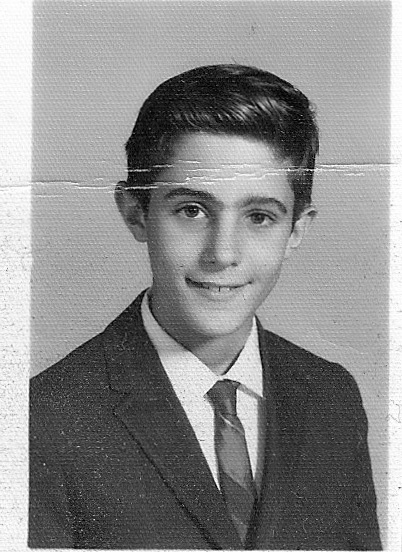 I got a chance to sail with my college friend, Keith, back a few decades ago, on his father’s sailboat. We took a trip out to the Coronado Islands, a group of four islands off the coast of Tijuana, and owned by Mexico. We were followed by a group of dolphins the whole trip, and I suppose they were expecting something, although I’m not sure what. Applause, maybe? The islands have an interesting history and I’ve included a link to the Wikipedia article. 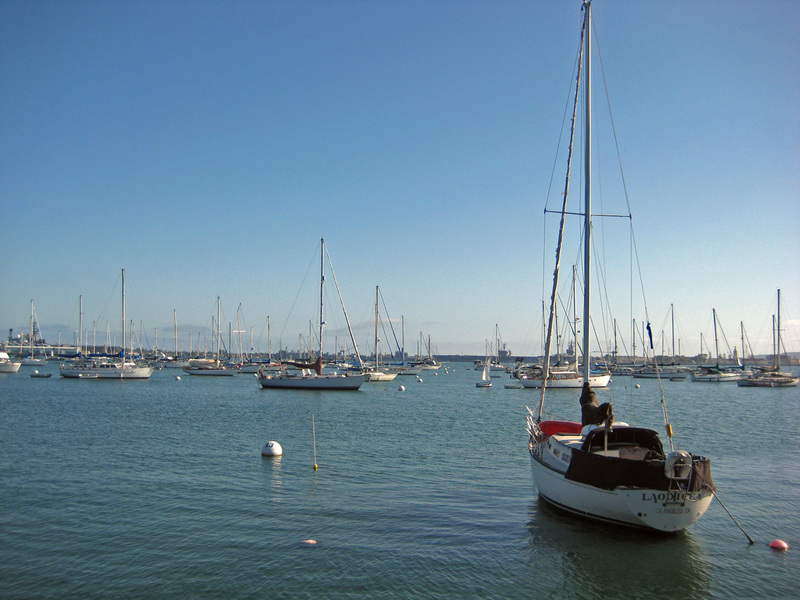 Sailboat Marina in San Diego Harbor at the base of Laurel Street. From the marina looking south along Harbor Drive towards downtown San Diego. Running along the pedestrian way, one passes the San Diego Maritime Museum, a collection of historic ships which are restored and operational. It includes the oldest operating sailing vessel in the world, the Star of India. 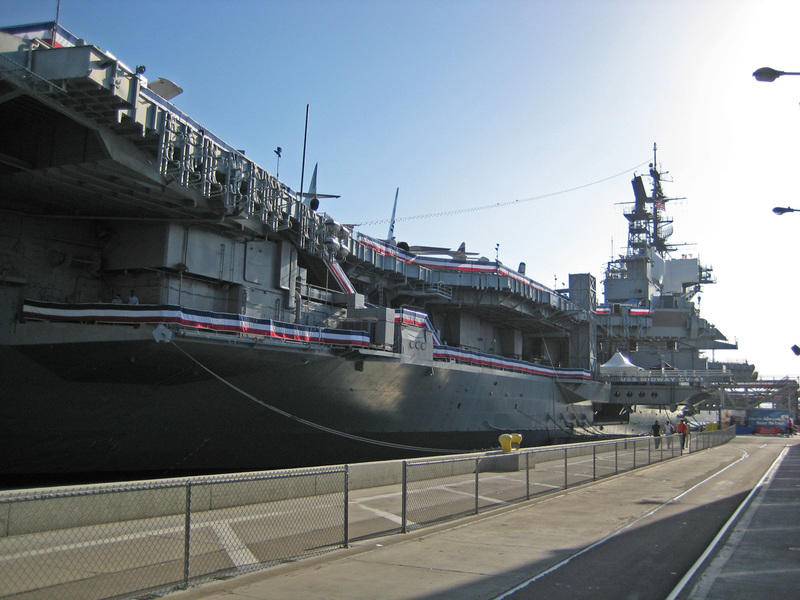 Farther down is the USS Midway aircraft carrier, commissioned in 1945, seeing action in Vietnam and Operation Desert Storm, and then decommissioned in 1992. It can be visited, and is also a popular spot for private events, as it is huge and can accommodate a few thousand wild party goers. The last mile of the five miles out on this loop goes past the Seaport Village, a touristy shopping and restaurant area conveniently close to San Diego’s hotel and convention center area. 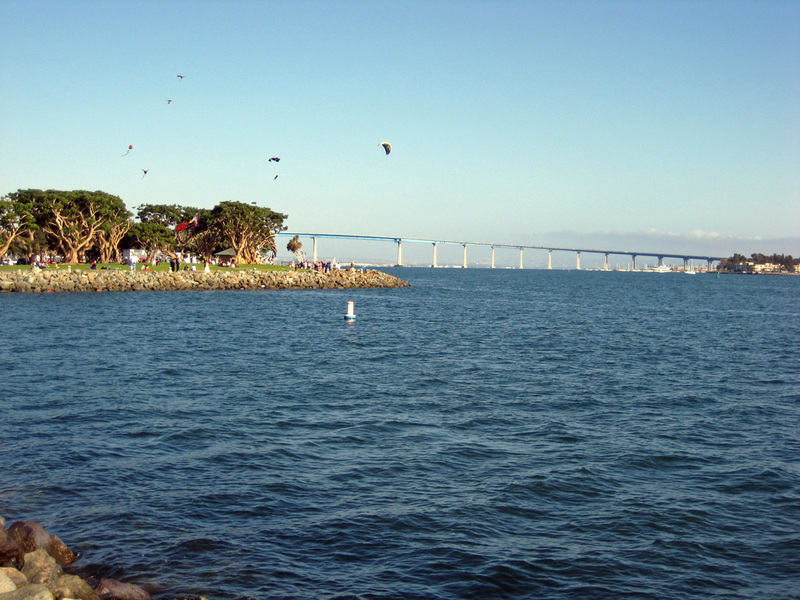 At my turn-around point, I had a nice view of the Coronado Bay Bridge (different Coronado than the islands mentioned above), and people flying very large and complex kites on a point of land extending into the harbor. I then turned around and headed back towards Laurel Street, following the dictates of my Garmin. I reached Laurel, and began the climb back up towards Balboa Park. Still at sea level, going past the airport, I had the misfortune of taking a wrong step. I think I was a bit beat by the fact that the sun came out early this day, but I clearly wasn’t paying attention. Either that, or the sidewalk in front of me magically rose about an inch, and I hit the lip of concrete with the toe of my right shoe. I took a quick fall, in kind of a rolling fashion, and I can still remember going down. I knew it would hurt, but when I hit the sidewalk with my right shoulder, it seemed to hit with a great deal of force. A shock went through me, and I lay face down on the sidewalk, slow to recover. My first concern was that I thought I must have broken my collar bone. I slowly rose to sitting position with a great deal of pain in the right shoulder. I ran my hand over the collar bone, and didn’t feel any change in the contour, or bone fragments sticking out through the skin. I tested my range of motion, and found that I could still move my arm around in a circle. So, I decided it wasn’t broken. Next, I stopped my Garmin, which may seem obsessive, but perhaps my running friends will understand. After another few minutes on the sidewalk I decided to get up and see if I could still run. While the shoulder hurt, I was still able to run, so I headed back up the hill for the long climb to the park. Oh, and I restarted the Garmin. 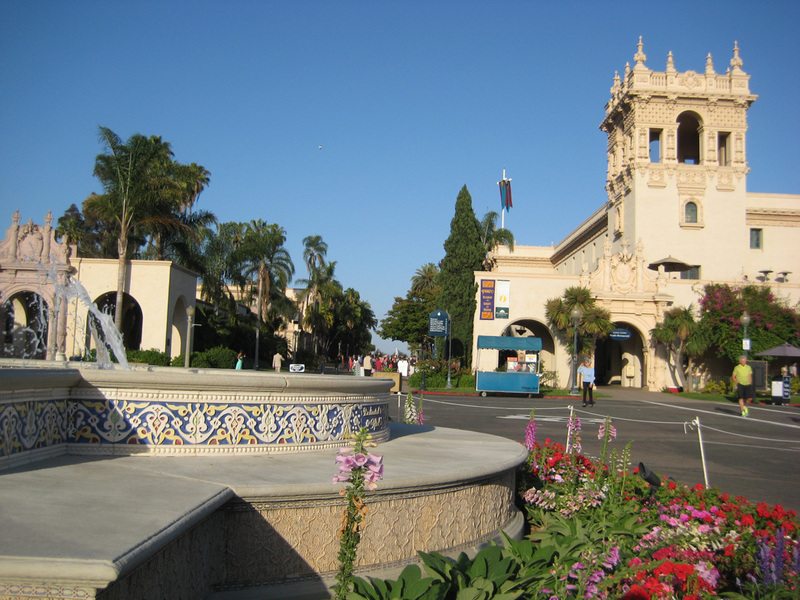 Reaching Balboa Park, I headed straight along El Prado, crossing the Cabrillo Bridge. This bridge was built in 1914 for the Panama-California Exposition in 1915 celebrating the opening of the Panama Canal, and was the impetus for building many of the buildings in Balboa Park. 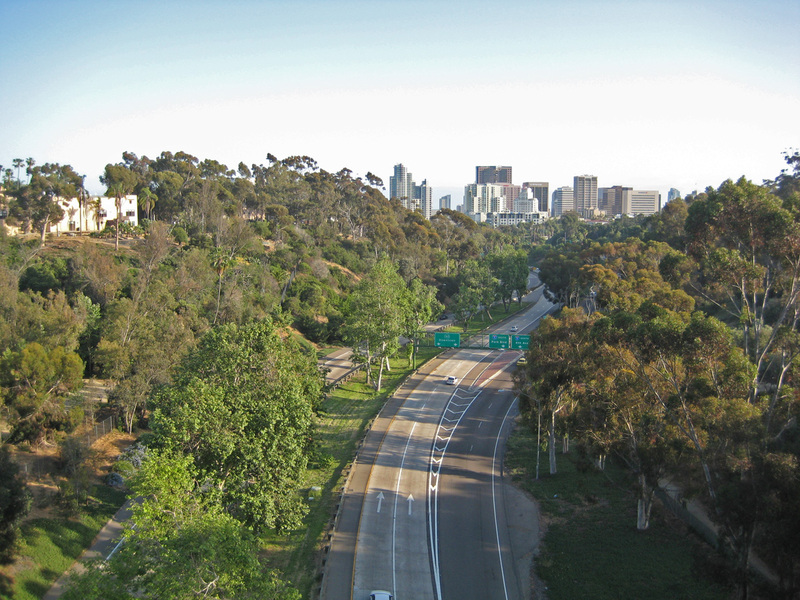 View facing south from the Cabrillo Bridge, over Highway 163, the Cabrillo Highway. Continuing over this attractive bridge, one enters the part of Balboa Park with museums, restaurants, and a very beautiful botanical garden. The Spreckles Organ, a large outdoor pipe organ pavilion is nearby, and was also built for the 1915 Expo. I then finished the run heading back to my starting point, taking me past the San Diego Zoo, and back to my daughter’s apartment. My shoulder was hurting pretty badly by then, so I took some aspirin, and told my family about my fall. They were concerned, and quite sympathetic, although I detected a note of “you should be more careful”. I think I was just thinking that myself, and they really were quite sympathetic. I felt foolish, but thankful I still had an intact clavicle. 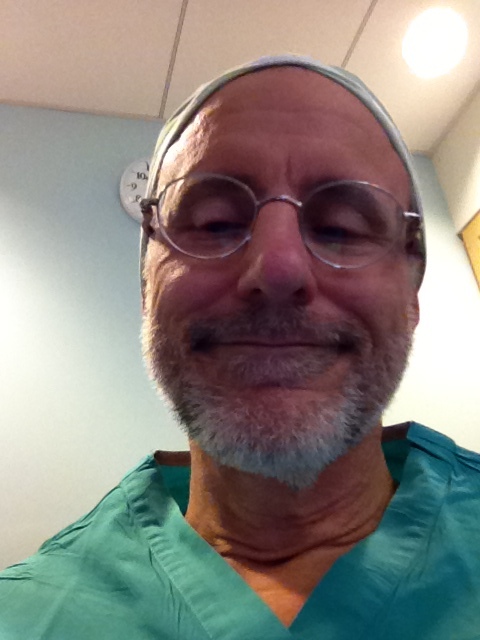 I downed a lot of aspirin the next two weeks, as the pain gradually subsided. It didn’t get in the way of me enjoying my Hawai’i trip, though, and for that I’m very appreciative. Who, according to the Philadelphia Commerce Director, did more for Philadelphia than anyone since Ben Franklin? Who put South Philly on the map? 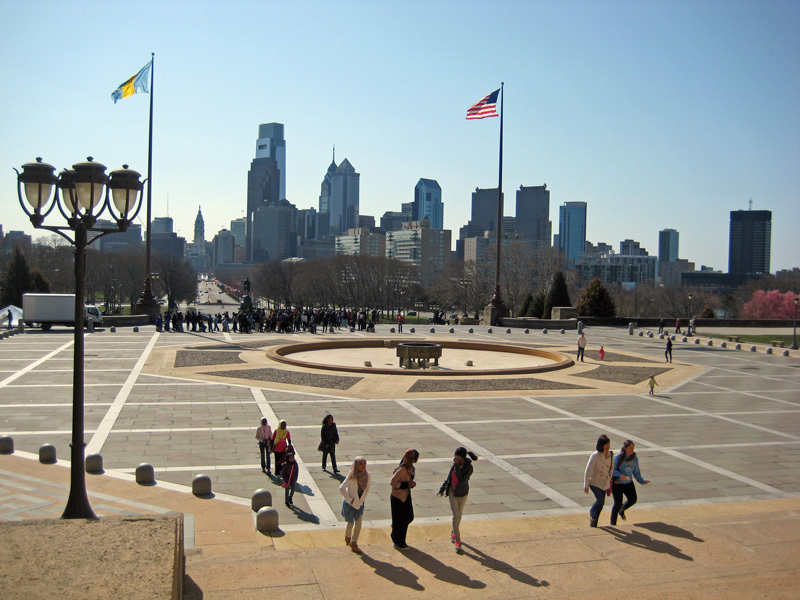 And, who ran up the art museum steps in one of the most recognizable movie scenes of all time? Right, Rocky Balboa! 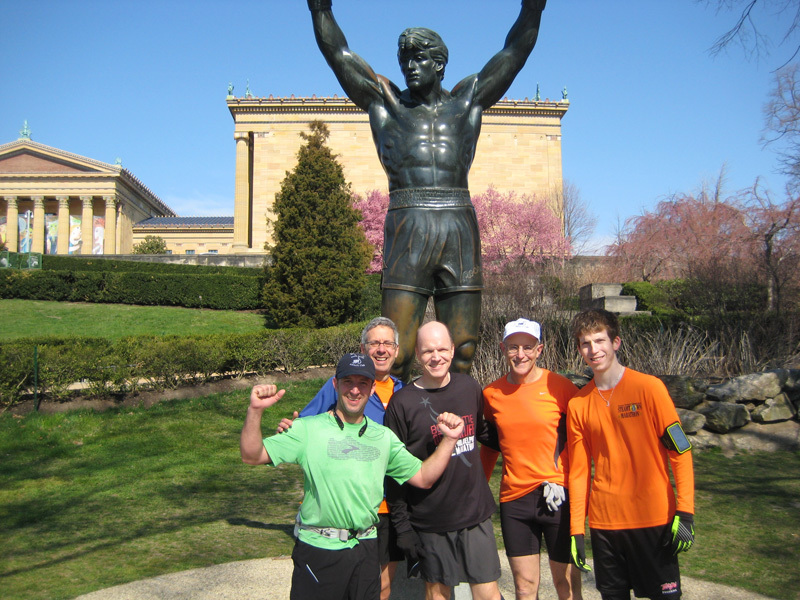 So, to dedicate a run to our Philadelphia (fictional) hero, we came up with a Sunday run which would celebrate Rocky. This was to be a point to point run, starting in our home base of Haddonfield, NJ and finishing up the steps of the art museum, with a total distance of 14 miles. 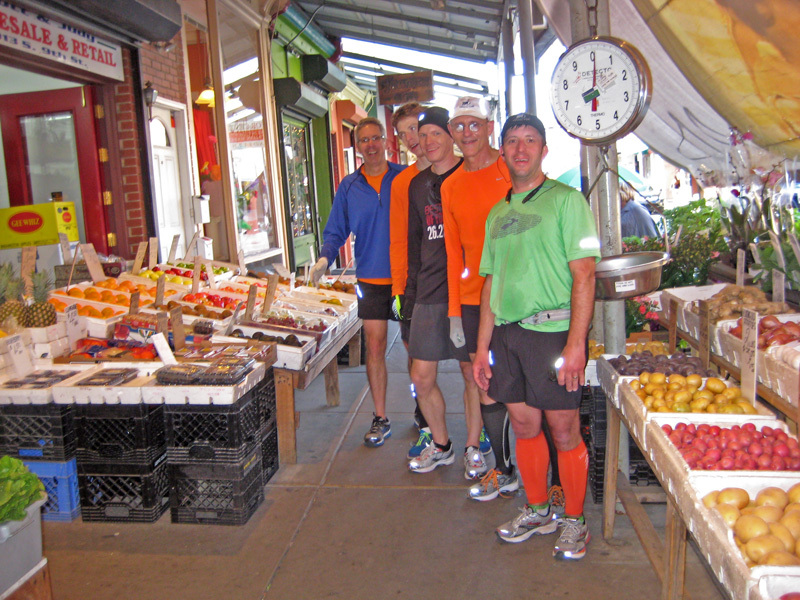 Our choice of this weekend was a bit of a problem for a few of our usual Sunday runners. Some are running Boston next Monday, and didn’t want to do a challenging long run this close to their marathon. Some felt they weren’t ready for that distance. And some were doing a longer run readying for a May marathon, wanted to get in 20 plus mile runs, and finish close to home. That left seven runners ready to take on the Haddonfield-Rocky Run challenge. 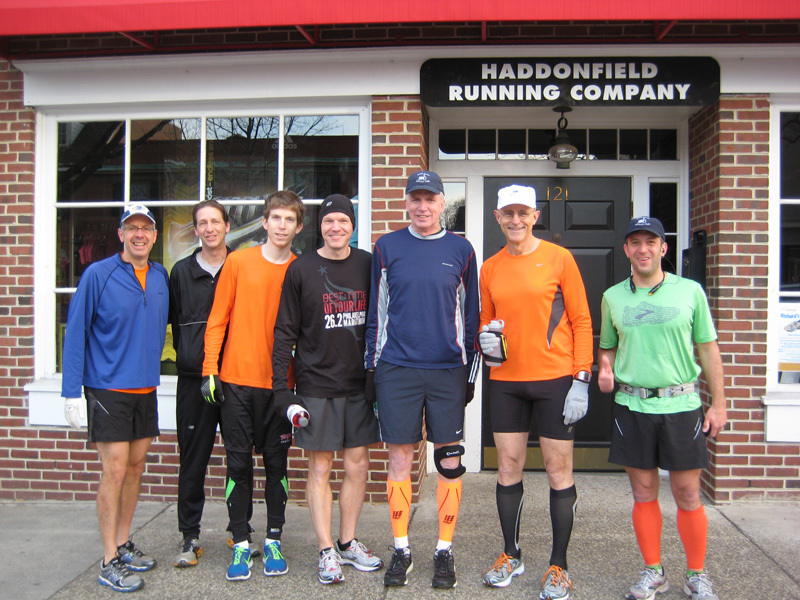 Steve, Dave, Dan Brian, Rich, Frank and Keith, at the start of the Haddonfield-Rocky Run. 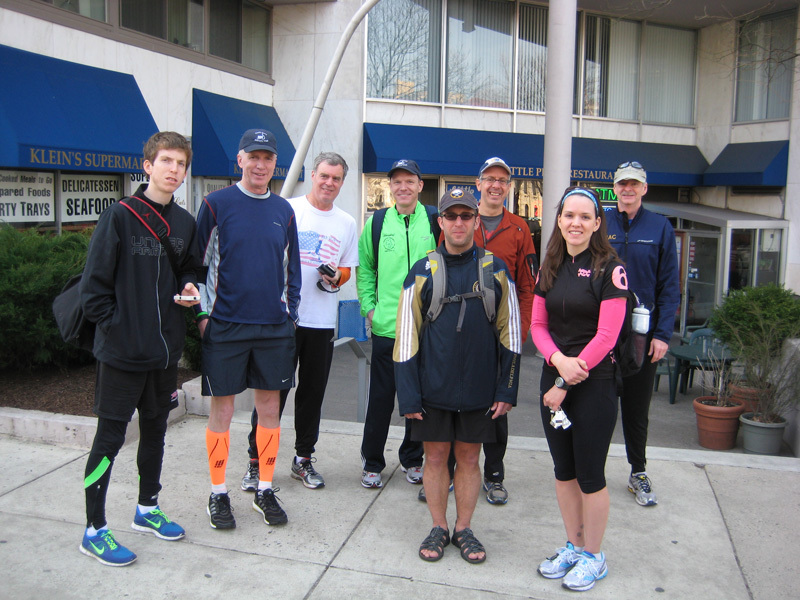 The route started off as our usual Sunday run does, heading west to the Cooper River park. Then, though, we kept heading west. Crossing route 130 may have been the most dangerous part of the run. It’s a busy highway with the crosswalk shut down for construction. 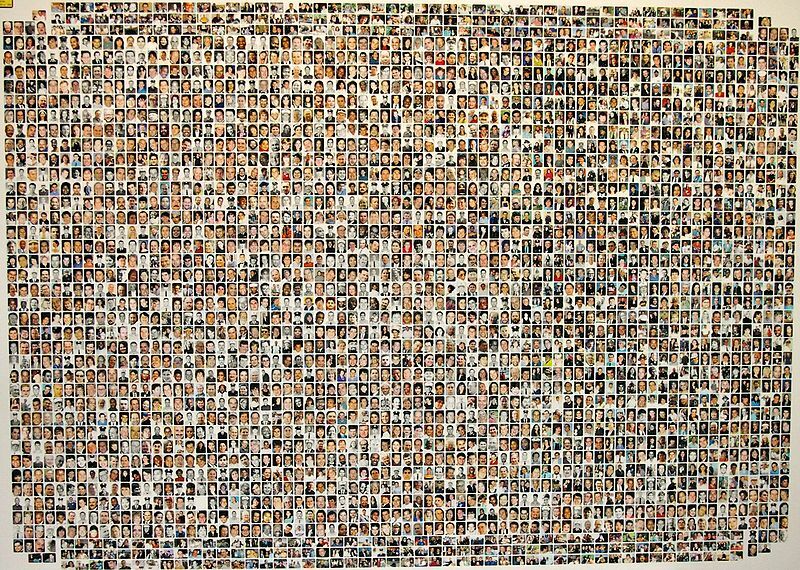 In a marvel of broken field running, we all managed to cross without a single loss of life. Then, we headed down Admiral Wilson Boulevard. This road once was home to several notorious stripper bars and hourly rate motels. When the Republican National Convention came to Philadelphia in 2000, then Governor Christie Whitman had the buildings demolished and the whole area turned into parkland. While this returned the good name of Admiral Wilson to honor, it also removed sorely needed tax paying businesses from Camden’s base. We ran down the curvy, paved, path along the Cooper River on one side, and Admiral Wilson Boulevard on the other, towards the City of Camden. We then headed into the center of Camden, and to Cooper Hospital. Two of us, Steve and myself, work at Cooper. 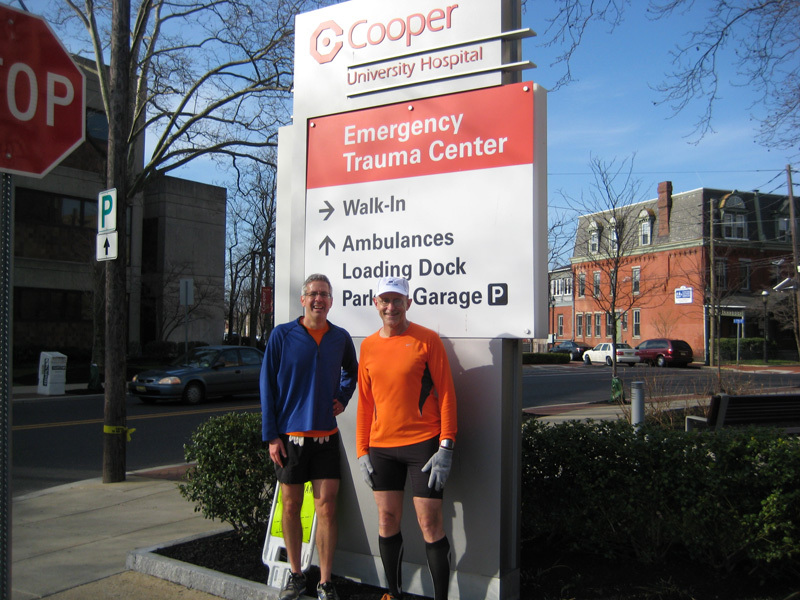 Steve and Frank at the entrance drive to Cooper Hospital. We had the audacity to run right through the hospital, starting at one entrance, heading through the lobby to our new Pavilion building and out the other entrance, with a quick restroom stop in the middle. 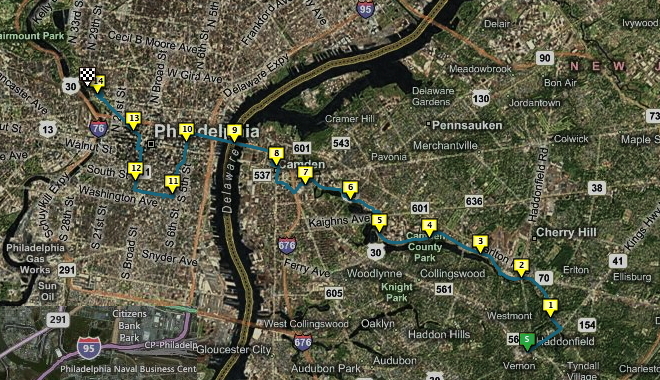 From there, the route went past Rutgers in Camden and on to the Ben Franklin Bridge. At the high point of the walkway on the south side of the Ben Franklin Bridge, with Philadelphia in the background. After crossing over the bridge, we headed south down to the Italian Market. This is where a local shopper tossed an orange to Sylvester Stallone as he ran through the market in an unscripted moment in the first Rocky movie. The scene was Rocky on his famous run, and was kept in the movie. Did the orange come from this vegetable market? Maybe. Alas, there were no fans cheering us on through the streets of what was once called The 9th Street Curb Market. It is by no means only Italian, although the Italian immigrant presence is strongly felt, in places like D’Angelo Bros.’, purveyors of meats and game, and Lorenzo’s Pizza, my personal favorite for a Philly cheese steak. There are Chinese, Vietnamese, Korean, and Mexican foods, stores selling every kitchen utensil and appliance one could imagine, and a fine cubbyhole of a shop selling all manner of spices from around the world. As much as I would have loved hanging out here and visiting my favorite shops, we shot off farther west across Broad Street to 15th. 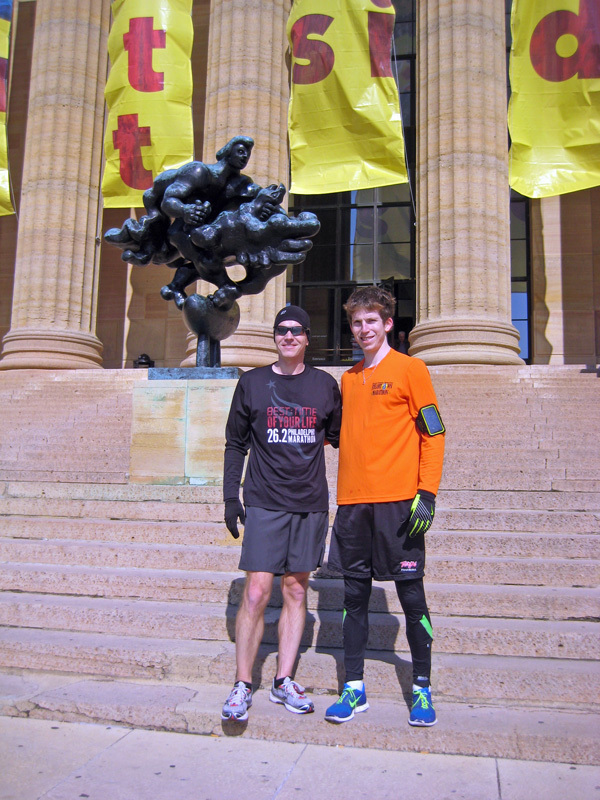 We then headed north to the Ben Franklin Parkway, and the last stretch of our run. By this time, the group had splintered a bit. Steve, Keith and I hit the beginning of the BFP first. 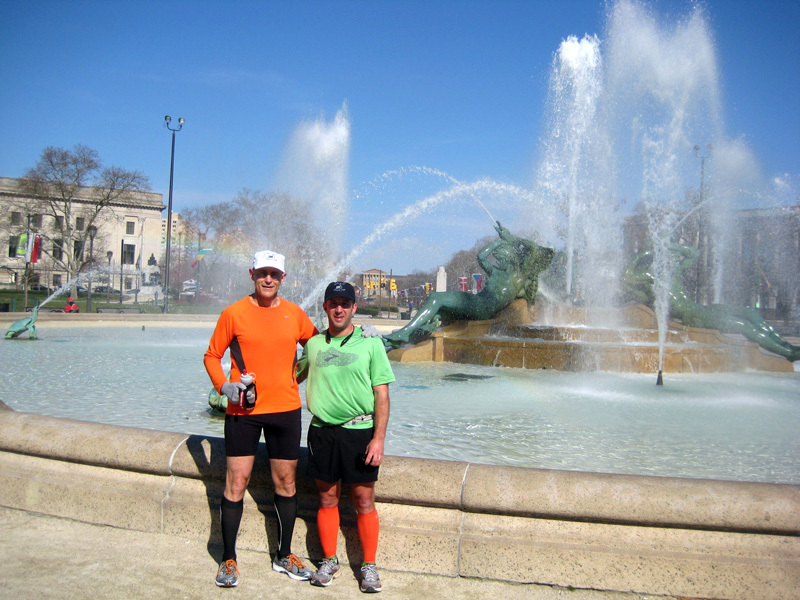 Keith and Frank in front of the Swann fountain in Logan Circle, symbolizing the three major rivers of Philadelphia. The art museum is in the distant background. From here we shot right down the middle of the Ben Franklin Parkway, and made it to our goal, the steps of the Philadelphia Museum of Art. This is a hot spot for tourists, and this beautiful Sunday morning was perfect for the run up the steps. There were several tour buses in front of the museum, and as we approached we could see a couple of hundred enthusiastic visitors vicariously living Rocky’s finishing sprint up the steps. Rocky collapsed on his first run, but these enthusiastic young people jetted up the steps like they were in a Red Bull commercial. For us, we were at the end of a long run, but still had a nice adrenaline kick to make it possible to hit every other step on the way to the top. Looking back at Philly from the top of the uppermost Art Museum steps. It did seem a little anticlimactic once we had hit the top. Now what, was my thought. Partly, the day was so nice that we didn’t have the cold, the heat, the rain or the wind that I thought would make this extra tough. But then, as I looked around and saw the city, it felt we had accomplished something. 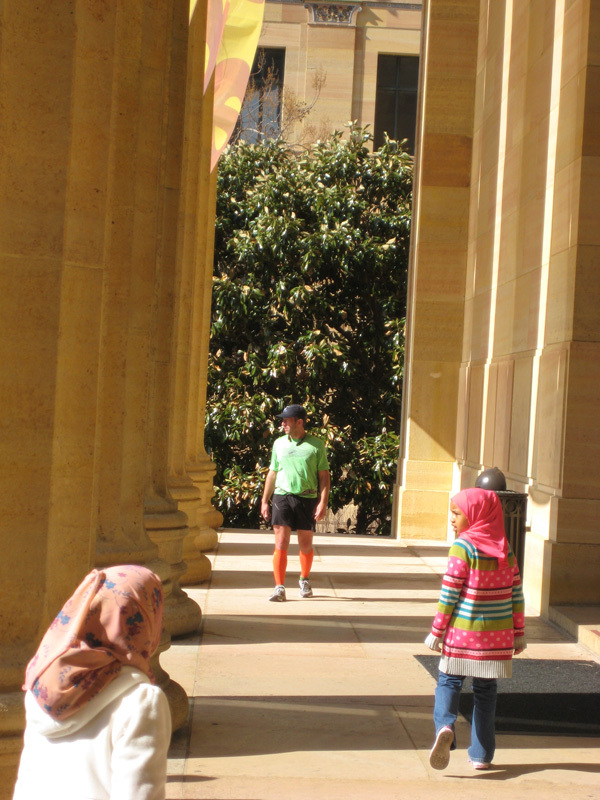 Keith, amidst the columns of the museum entrance, rehydrating. Brothers Brian and Dan on the steps. The statue behind them is Prometheus strangling a Vulture, by Jacques Lipchitz, his take on Hercules taking on the Eagle. It represents conquering adversity. Having reached our goal, we had one more, very necessary task to complete. We needed a photo with Rocky, the statue, that is. The statue was commissioned by Sylvester Stallone for Rocky III and initially placed at the top of the “Rocky Steps” in 1982. But museum folks objected and it was relocated to the Spectrum sports arena. It was brought back to the museum again in 1990 and 2006, and finally found it’s permanent spot on the grounds outside the museum. It is one of the most photographed sights in Philadelphia. Keith, Steve, Brian, Frank and Dan with Rocky. Dave helped Rich get to the finish a bit behind the rest of us. After a good run, what could be better than a good breakfast. We all headed over to Little Pete’s on Fairmont Avenue, to scarf down some pancakes, eggs, sausage and coffee. We were joined by a few of the others in the club who had gone cycling this morning or run a shorter distance. Now, we are planning for Rocky II. Outside Little Pete’s, a fine place for a delicious breakfast. Route of the Haddonfield Rocky Run. Whoa, this wasn’t supposed to happen (Sandy, that is). It’s raining, but Hurricane Sandy’s full force has yet to take effect. One thing I’ve found fascinating, and sometimes discouraging, is the way we sign up for a marathon many months in advance, start the training program about four months before the race, and have no idea what may befall us during that time. 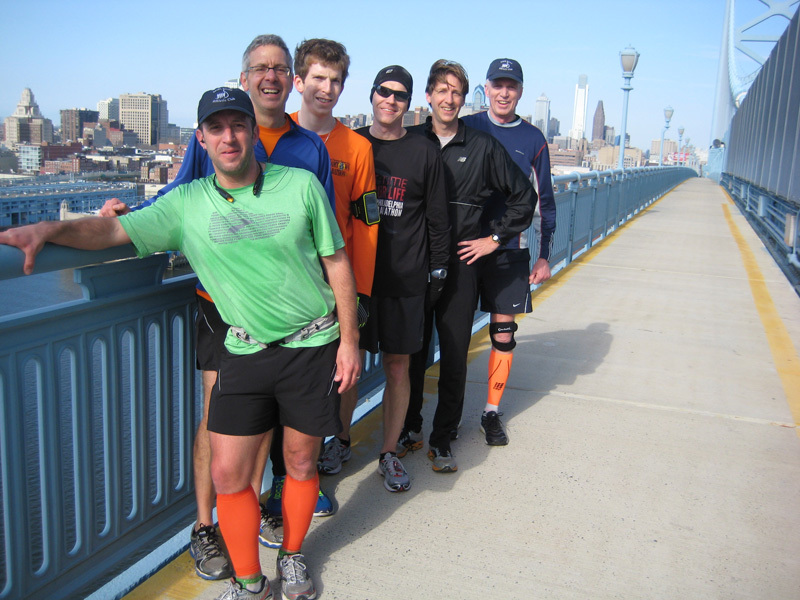 Right now, it’s hurricane Sandy which is disrupting our smooth passage to the Philly marathon, Nov. 18. 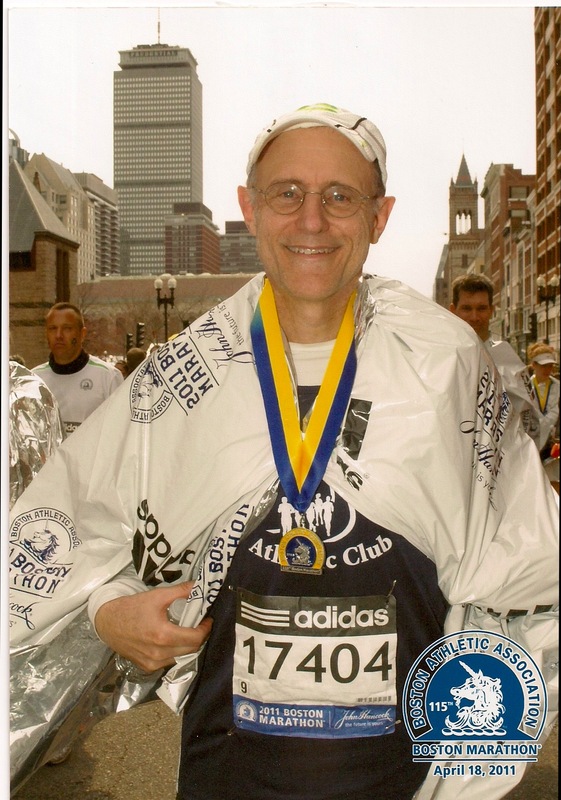 It’s also one week before the New York City marathon, and a few of our club members are running that race. With one week to go for NYC, a forced couple of non-running days may be just what they need to be in top form. Where I live in South Jersey, minutes from Philadelphia, we are, as the forecasters have noted, in the “cross-hairs” of the hurricane. As a hunter, that implies intent, as if we are the target. In fact, it is the joining of weather forces, with a waxing moon and rising tides, that steers this particularly enormous weather system directly towards us and makes it so threatening. Not very long ago, around 1960, the first successful weather satellites were launched which allowed tracking and predictions of hurricanes’ paths. Before then, barometers and reports from the Caribbean were harbingers of a storm, with little predictability of which way the storm would go. Our house was built in 1884. I imagine at that time, a storm of this nature would be devastating, with no hint of it’s arrival. It is humorous, though, to see what is going on at Lowe’s and at the grocery store in terms of preparedness. At Lowe’s, they were completely out of “D” batteries, for powering flashlights, I guess, although other appliances come to mind. Plenty of AA or AAA, though. I noted a good number of customers buying a garden hose and a pump. I’m not sure if the pump was plug-in or manual, but good luck to them who need to pump out the water with that limited device. We were at Lowe’s for a new washing machine, since ours died. Not many folks shopping in our side of the store yesterday. At the local Acme and at Lowe’s, customers were carting away enormous plastic-wrapped bundles of 0.5 L water bottles containing 50-100 bottles per bundle. I can see a use for this. If the water level gets very high, one can empty the water bottles, put the caps back on, and create a raft by tying the bundles together. If one is concerned about the water supply, another, perhaps saner approach, would be to put water from the tap into available containers at home, but that means not contributing to the economy, so never mind. We did a check of all our outdoor areas, for loose furniture, potted plants and other objects that might take flight in the storm. Of major concern around here is the possibility of trees coming uprooted as the ground soaks and the winds rise. We have a few tall trees close to our house, hopefully strong, and also hopefully protected from the full force of the wind by being between houses. Our tallest tree menaces were taken down in the last few years, having lived to about 100, and starting to drop large branches indiscriminately. My hospital was closed for all but emergencies today, so no elective procedures. The trains are not running into Philadelphia. The bridges are staying open unless sustained winds up to 70 miles per hour hit, then they will close. 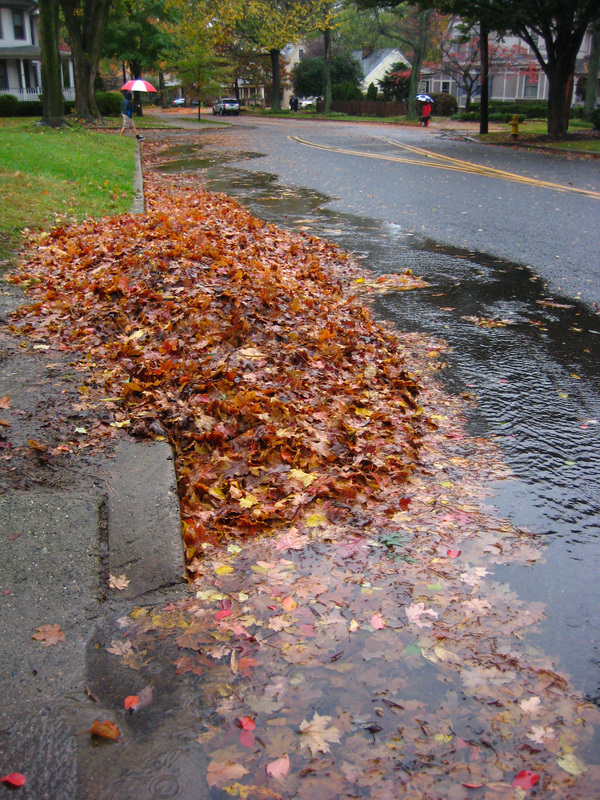 At the moment, it is fairly windy, with a steady fine rain blowing sideways, covering areas usually under cover with a wet sheen, and creating large puddles around the leaves raked into the streets. The township was supposed to do an emergency leaf removal yesterday, but I didn’t see it happening. The center of the storm is due to hit New Jersey around midnight tonight. I think our offices will remain closed tomorrow, since this storm has not yet peaked, and is cruising at a very conversational pace, to relate it to running. By the traffic I see from my window at home, plenty of folks are braving the weather. I am taking this opportunity to catch up on things I say I will do, but can’t seem to find the time. Hopefully, by at the latest, Wednesday, we’ll be able to get out there and hit the pavement. I hope all of our neighbors, i.e. the whole eastern seaboard, remain safe and dry.